The NCLEX-PN exam is not just about what you know—it's about how you think. 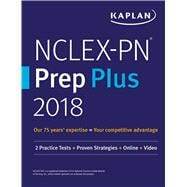 Kaplan's NCLEX-PN Prep Plus 2018 uses expert critical thinking strategies and targeted sample questions to help you put your expertise into practice and ace the exam! Get everything in the NCLEX-PN Prep 2018 package, plus one more practice test online, additional practice questions, 60 minutes of video tutorials, and a digital copy of the book. With NCLEX-PN Prep Plus 2018 you can study on-the-go. Log in from anywhere to watch video tutorials, review strategies, and take your online practice test. Kaplan's Learning Engineers and expert psychometricians ensure our practice questions and study materials are true to the test. The previous edition of this book was titled NCLEX-PN Premier 2017. Since 1982, Kaplan Nursing has been providing the nation’s leading NCLEX-RN Examination Review. Led by experienced nurse educators, Kaplan Nursing prepares thousands and thousands of nursing students for the NCLEX-RN examination each year. With our focus on industry-leading service, great value, and ease of use, we provide benchmark and predictive testing for both RN and PN/VN programs. For more information, visit us at kaplannursing.com.